Can you believe the year is half over? Just the other day, I was saying how thankful I am that it's not been super hot...yet. No 100 degree days! But, alas....that's supposed to happen by the end of this week, and most, if not all of next. But I'm happy to say that we had a GREAT 4th of July weekend at my husband's cousin's home...on the farm. Here he is, standing at the end of the pier reflecting. Memories. 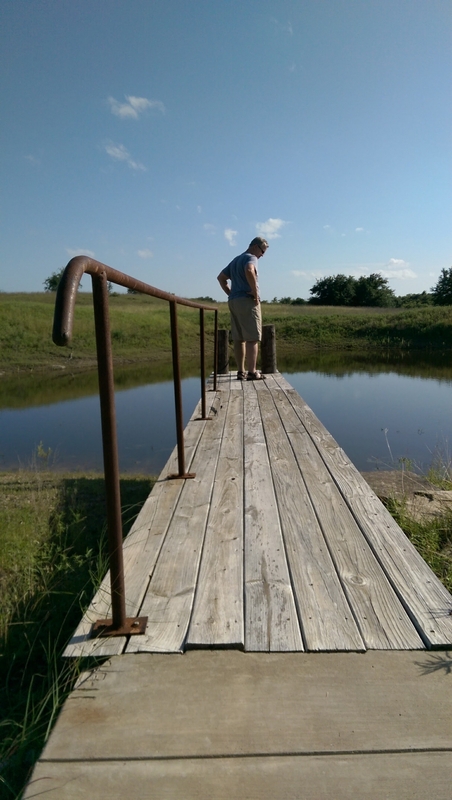 This is a spring-fed watering hole he used to swim in as a kid. Reflection can be powerful. It was a fun family reunion, and we're so grateful to have these times. It's a beautiful area too, so that makes it easy to just sit and enjoy great food, great conversation, great peeps, and reflect on great times. We always look forward to more! What are you reflecting on at this mid-year point? We are halfway through 2017, and you might be thinking that your resolutions for 2017 have…gone (way) by the wayside. In fact, you’ve probably started to think about your 2018 New Year’s resolutions. Am I right? Personally, I'm not a fan of New Year's Resolutions, but you probably already know that. So many people commit to huge resolutions each year that are nearly impossible to achieve. Then, they end up not reaching their goals because the fast track didn't stick. And even if they come close, they can’t maintain their achievements to mid-year. Um…that would be…like, now. One suggestion I have for you is to have Mid-Year Solutions that are ACHIEVABLE for the rest of this year. In spite of what health and fitness goals you set for yourself in January, if you can do these 4 things, you can be so much healthier by the end of the year. "And what might those be, Deni?" I'm so glad you asked! Have you ever noticed that when you drink more water you feel better? Need more energy? Drink more water. Got dry skin? Drink more water. Balance slightly off? Drink more water. Can't think clearly? Drink more water. Systems running kind of slow? (ugh) Drink more water. Simply put, water helps your body to run better and will even assist your efforts if you’re trying to lose weight. Tah-dah! Water will help give you a beautiful (or handsome), youthful glow too. Make sure that you don’t just chug it all at once. Grab a water bottle and keep it with you throughout the day. This will make it that much easier to stay hydrated and achieve your water intake goal. In the end, it will be so beneficial for your entire body. Plus…it’s summer, and that takes hydration up a notch. Unhealthy foods that are filled with sugar and toxins do our bodies no good. Instead of just eating because you have a sweet tooth craving or because something looks delicious, eat because you want to nourish your body. That changes everything. Eating 100% "healthy" (whatever that means to you), is probably unrealistic most of the time. But, if you eat foods that will give you energy and help you to feel better, you’ll be on track for a healthier rest-of-the-year. So round out 2017 by eating more whole foods that nourish and benefit your body. Remember, not 100%, just try doing just a little better the rest of the year. Step by step. Most people think of a New Year’s Resolution as heading to the gym early every morning before work to do some crazy gut-wrenching workout. Some try closing out the day with a gym workout on autopilot just to get it in. And as soon as they get tired of that new schedule…they stop. Although this may seem like a great goal initially, it can sometimes be unachievable with your schedule. You do not need to head to the gym to move more. Do I need to say that again? In fact, what would work for you? If you drink more water, you may have to get up to go to the restroom more. Cool! If you eat "healthier" foods, you may find yourself moving around more...in the kitchen. And shopping for groceries, of course. Way cool! What would some mindful movements look like every morning, for like, 5 minutes? Hmmm. If you sit all day it's a very good idea to go for a walk on your lunch break if possible, or even after dinner. Try standing up and moving around more throughout the day. And if you can schedule regular workouts in, 2x/week is a great goal! How many are you doing now? What can you do that would be, say, just a little bit better?Finish out summer and head into fall with mindful movement. Make moving fun for the rest of 2017. You will feel so much better by doing a little better! Ouch. Every person has thoughts that creep into their head. Yes we do. Sometimes we can become more judgmental and critical of others in our thoughts, or even put ourselves down. I say, find the positive in any negative situation. Neutralize a negative thought with a positive truth. It's pretty hard to hold on to the negative and the positive at the same time. That's draining. Which do you choose to let go of? How about finishing out the year with a goal for yourself to stop the negative thinking dead in it's tracks. Don't let it get comfy in your head. This will help you to be an overall happier person, help others (yep), and help you to become healthier overall. It’s time to let go of your 2017 New Year’s Resolutions. Focus on the 4 Mid-Year Solutions instead. As you reflect on your mid-year point, don't let "I'm not sure what to do next," get in the way of getting started. Break through that excuse now! You can get a complimentary Breakthrough Strategy session, just for the asking. Click HERE for instructions and to complete the prep form. Action steps are the beginning of new habits. New habits are the beginning of change. Change is the only thing that will get you from where you are now, to where you want to be. In the end....it's a choice. If you feel like you’d like to go a little deeper, I have a 5-day challenge coming up next week. Double-Duty Week is 5 days of clean eating habits combined with 5 days of mindful walking programs to get you back on track or way ahead. Depends on where you are. Registration closes this Friday and prep material goes out on Saturday. Today is the last day for Early Bird Registration and pricing, then the price goes up for Thursday and Friday. Get all the details and go ahead and register HERE. P.S. As you know, I'm only sending my newsletter once a month as not to bombard you with more information than you want or need. Occasionally I will send you additional special information about something coming up, freebies, or just plain fun stuff. If you unsubscribe from all information, I'll be really sad. But if what we're doing here to be better at who we are and help others do the same, no longer interests you, we'll have to understand and wish you well. But stay! Onward and upward.